seals on their church gate. (Zhoukou, Henan—Feb. 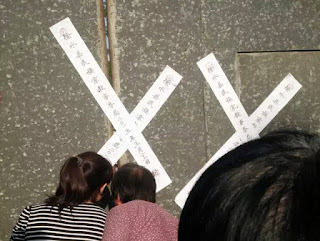 2, 2018) After the China’s new Religious Affairs Regulations went into effect yesterday, 19 towns in China’s central Henan province cracked down on Christianity, forcing Christians to meet secretly. Going door-to-door, many officials in the towns urged Christians to attend the government-censored Three-Self Church instead of their unregistered house churches and encouraged them to remove religious posters and crosses from their homes. On Jan. 6, Director of the Henan Provincial Religious Affairs Bureau Jia Ruiqin ordered the local government branches to fully implement the new Religious Affairs Regulations, which demand that all churches either register or face forced closure and severely restricts the freedoms of Christians. These new measures have put all areas of the country on edge as the religious wait to see how strictly the new regulations will be enforced. The 19 aforementioned towns dispatched personnel to promote the new regulations and explicitly forbid Christians “not to engage in religious activities in places unregistered with the religious authorities.” As a result, many Christians are meeting secretly in their homes, fearful of the public security agents. In addition, local Christians claim that teachers push their students towards “patriotism from childhood,” teach them not to believe in religion, and remind parents not to bring their children to religious activities or allow them to read religious material. ChinaAid exposes abuses, such as those suffered by Christians in Henan, in order to stand in solidarity with persecuted Christians, oppose these new regulations, and promote religious freedom, human rights, and rule of law.